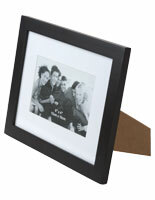 These Picture Frames are Only Some of Our Wide Selection of Black Photo Frames for Sale Online! 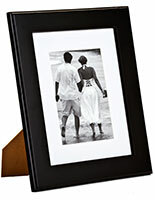 These Picture Frames Include Matting in Ivory White for a Refined Appearance! 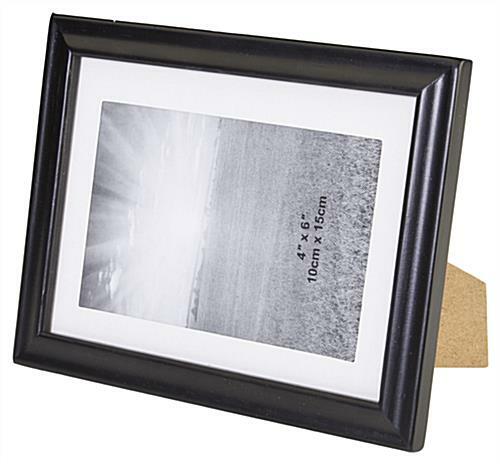 Purchase Poster Frames with Wood or Metal Borders Today! 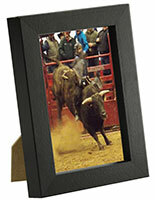 These picture frames have a traditional style that matches any home or office interior. Each unit is crafted from durable wood. 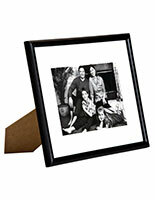 The 3/4" wide wood molding of the picture frames augments photographs, without distracting from the displayed images. A sleek design allows each display to seamlessly integrate into any atmosphere. 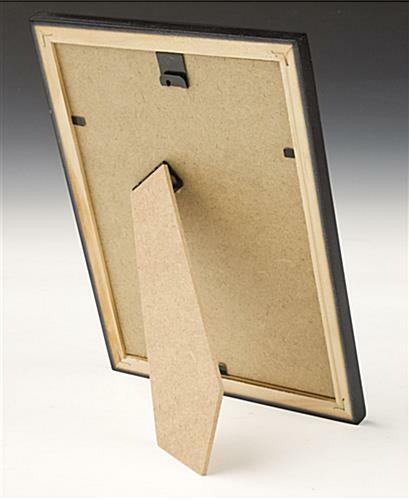 The wood photo frames have a black matte finish that subtly focuses the eye on the exhibited pictures. In addition, this unit includes a white mat to further enhance prints by supplying a 1/2" wide white border around all sides of the image. 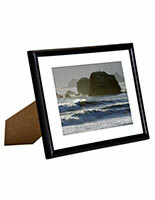 The matting provides a viewable area of 3-1/2" x 5-1/2" for images ranging in size from 5" x 7" to 4" x 6". Photographs measuring 5" x 7" fit perfectly into these black frames. 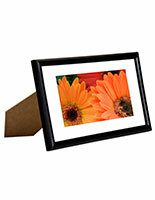 A 4" x 6" picture will need to be adhered to the mat in order to stay centered within the display. Remember when displaying 5" x 7" graphics without the mat the print will be covered 1/4" on each side by the wood border. 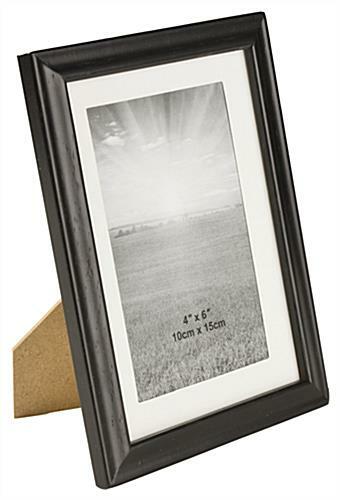 The glass lenses that are provided with these picture frames protect prints from dust and damage. There are three metal retainer clips located on the back of the framing that bend to secure the components. These picture frames, also called poster holders, have an easel backing to stand on a countertop either vertically or horizontally. Equipped with a hanger, this unit mounts to the wall in landscape or portrait orientation, as well. 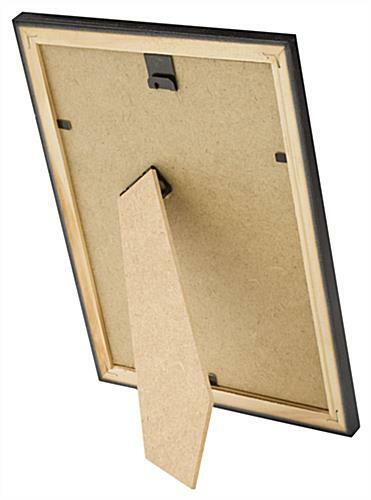 The hanger attaches to the backer board, and can be positioned along any of the four sides. This picture frame incorporates all the features found in more expensive displays, yet costs just a fraction of the price! The frame is attractive and well constructed. Has a nice backing and the mat adds versatility. I was able to print on it to add criteria for the intended use of displaying needle work. The dual hanging option is nice to have.